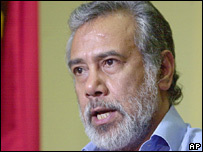 East Timor's President Xanana Gusmao appeared to take a step back from his threat to resign, a day after issuing an ultimatum to his prime minister. Mr Gusmao had demanded that PM Mari Alkatiri step down and said if he refused, he would leave office himself. But after hours of tension, Mr Gusmao told thousands of supporters gathered in the capital, Dili, that he would "honour the constitution". "I will fulfil my obligations based on your demands," he told the crowd. Earlier in the week, Mr Gusmao had sent a letter to Mr Alkatiri demanding he step down in the wake of East Timor's worst violence since independence in 1999. But Mr Alkatiri on Thursday appeared to have the support of ruling Fretilin party members and said he was standing firm. 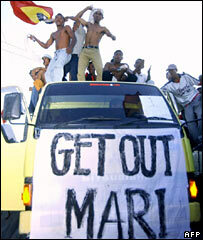 Some 4,000 chanting supporters had gathered in Dili amid tight security to back Mr Gusmao. "The president should not step down," one of the protest organisers, Agosto Junio, told AFP news agency. "Mari Alkatiri is the one to blame for the trouble. He is a communist, a criminal." But there were signs earlier in the day that Mr Gusmao was reconsidering. He met a senior bishop, Alberto Ricardo da Silva, who said after the meeting that Mr Gusmao had "agreed to a rethink". The president is a widely respected former guerrilla leader, seen as perhaps the only unifying figure amongst East Timor's leaders. Mr Alkatiri, although backed by his party, is increasingly unpopular. Many people have blamed him for failing to prevent recent unrest in which at least 21 people have died. Thousands have fled their homes. He has also been hit by allegations that he helped recruit a "hit squad" to act against his political opponents - accusations he denies but which Mr Gusmao said contributed to his loss of confidence in his prime minister. The Fretilin central committee is due to meet on Saturday and various options will be discussed, including replacing Mr Alkatiri or the resignation of the entire government, Fretilin sources told Lusa news agency. But there were growing fears that the ongoing political crisis could spark further unrest. "I'm afraid it could become violent; more shooting and burning of houses," said protest organizer Augusto Junior Tridade. There now a number of armed factions, some originating in the army and police, who are backing one side or the other, says the BBC's Jonathan Head. In these conditions the United Nations must somehow try to start a new mission to help rebuild the country's damaged institutions. The prospects for success look unpromising at the moment, our correspondent says.